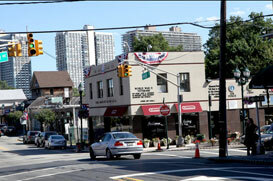 Once tagged as the capital of motion picture in America, Fort Lee is located in Bergen County, New Jersey. This thriving borough highlights deep historical inclinations set against its modern day charm. Aside from being the melting pot of 19th century’s film industry, Fort Lee also served as the homeland of subliminal advertising. Today, Fort Lee is home to over 35, 000 residents or 16, 371 households. This borough boasts of fine architectural constructions with high-rise residential buildings dominating the surroundings. Some of the tallest buildings found in this borough include Century Towers, Horizon Towers South, River Ridge, and The Colony. Fort Lee affords city dwellers a scenic view of the George Washington Bridge, one of the most notable landmarks in New Jersey and also the tallest construction in Fort Lee. This borough was established in 1904.